Spring is coming (please please please, I’m begging!) and while its still early, it brings back to mind Sports Day at Random Island school. Back for the first few years when we went there, every year we’d have a sports day, with races, discus, shot put, and the like. There’d be ribbons, and prizes, and a great time. The highlight of this was that it was held, at least early in the school’s history at Vardyville Park, also known as Reub’s Farm. To the best of my knowledge, and I can only go from memory of conversations, Reuban Vardy had a farm on this land, which was just over the Britannia road from Hickman’s Harbour. In my day, it was a private park with a store/take out and pinball machine, and a rudimentary ball field (at least I think there was a ball field). I remember fries and hotdogs and snacks throughout the day. Events tend to run together over the years, and these sports days were in the mid 70’s after all, but I do recall the pinball machine. It cost 10 cents and I’d play what felt like for hours, but of course it wasn’t because I also remember spending a ton of time outside, racing, throwing shot put, and participating (badly) in whatever events we had. And of course, watching Randy Baker and I think Shawn Avery playing stretch with every school boy’s crush, Miss Sargeant. I’m not sure what became of the park, but in any event, it was a beautiful spot of land, with the rattle in the background, and we as kids had a great time there every year while it was still the host site, and it holds a special memory of my youth. 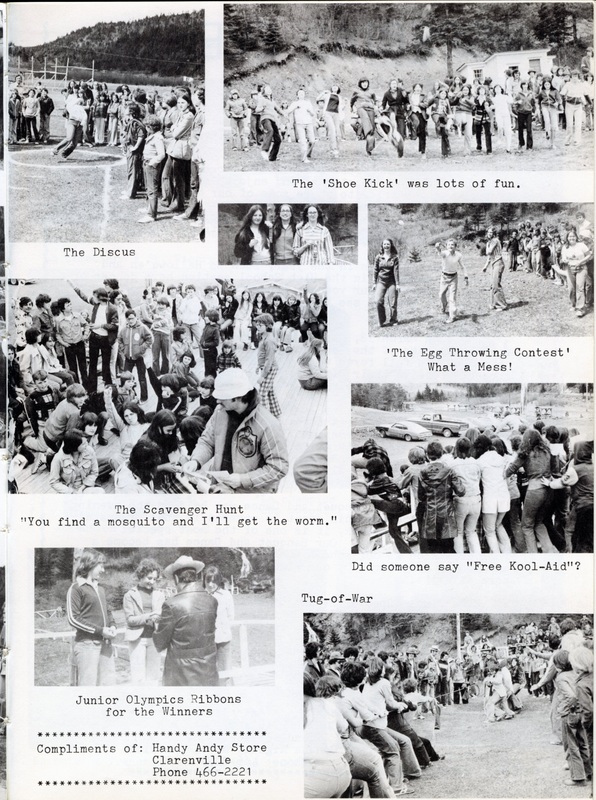 UPDATE: Added a couple pictures scanned from yearbook. I never knew or remembered they had movies over there, but it closed up when I was pretty young too. Just remember it from elementary school. Was a beautiful spot though. I loved sports day on the farm, great memories. Now its mostly grown over . I think there may be a building or two, but not the same has it was then. Too bad because I think it would have been a great experience for the kids today. Hello Peter, great job! Love your blog, and the idea of sharing stories about RI. It was shared with me through FB. For years I have been looking for pics of “Vardyville Park”, grandfather Ruben Vardy’s farm on Random Island. If you, or others who know you, have anything – people pics, newspaper article, old sign, anything, can you scan and send or take a picture of it and send it to me? Also looking to collect short stories/comments/memories from people. Please forward to all you know who may remember growing up with Vardyville. Thanks so much! 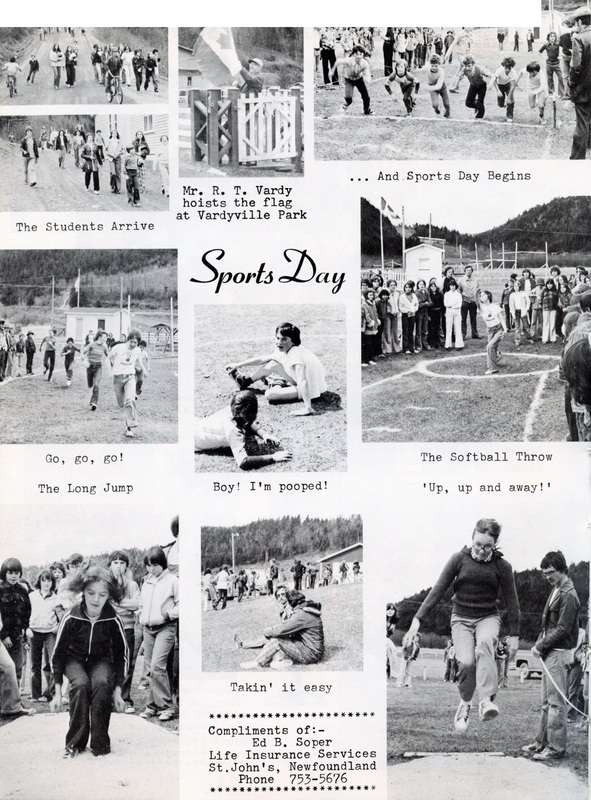 I think there were some photos of Sports Day (in black and white I somehow remember) in one of the old yearbooks, I can’t recall for sure. Am trying to find mine, but am not sure I have them anymore with the many moves over the years. Maybe check with some older graduates who may have the first yearbooks as well! Yeah there weren’t many places to hang out. Later on people hung out at the take-out near the school, and even later at the Lion’s Park, but before those there wasn’t much besides the farm. Too bad it’s gone. Never let it be said “there wasn’t much besides the farm” When I grew up there was always “The Crossroads” with a jukebox, pool table, and all the gear, and let’s not forget ” Fred’s” in Britannia…I think there were 2 pool tables there…Wow! and of course a jukebox….boy I’ll tell ya, some night’s she was rockin’ This was in the early 60’s and the school was right in Hickman’s Hr. Good times…Good memories…..
Heh I never knew Fred’s had pool tables, of course I can’t remember much of it before the fire. And I’ve never heard of the crossroads! Maybe cause I was too young and didn’t get down over the island much? Gloria is right, and I know Gloria, though haven’t seen her many years. The “Crossroads” belonged to my parents, Arthur and Doris Vardy. Now it belongs to our brother Rodney who lives in Clarenville. I learned how to drive on the farm before going on the main road. Brother Wade was learning how to do bodywork and paint cars. His pink and purple design was my first experience behind the wheel.. I have many good memories on the farm – berry picking, fishing, swimming, living in the cabin, climbing the apple trees, sleeping in 3/4 beds that dropped mattresses and springs to the floor in the middle of the night, getting chunks of ice from the sawdust, the lumber mill, the boy scouts camp puts, riding on the wood behind the horses, jumping and hiding in the hay lofts, helping grandfather serve customers in the store, Uncle Oliver and Res Hart playing their guitars (I think there was a Blundell son involved too. And, at the crossroads, my sister Maxine and myself took turns helping out behind the counter and cleaning. Many Saturday morninings we scrubed and waxed those floors, washed down tables, restocked shelves and the drink machine that cooled drinks with water. Mom used to bake pies and some other things to sell on weekends. The place would be very busy, especially as an ice cream stop. The ice cream freezer jacket is still being used back and forth from Ontario to Nfld. Dad had a television at the crossroads and charged 10 cents to everyone who wanted to come and watch the hockey game. The last ones to leave at night got a ride home with my father. I would dance with my friends to the juke box but listen for dad coming in from the garage so he wouldn’t catch me. Got caught playing cards one night and was told never to be caught with one in my hands again. Had no interest in them since. Funny, I smoked until I got caught and had no interest in that anymore either. Fred Burts was the place for dancing and hangin out for sure. Lots of picking up partners there, not to mention the outside goings on. When I wasn’t working for dad I hitch hiked to Burts praying someone would pick me up before reaching the crossroads because I didn’t want dad seeing me walk by. He would “know” just where I was headed. Oh the memories! Vardyville Park sure is a hugh lost to the Island. Now with all the campers on the go, I could visualize that place being so full. It always leaves a sad feeling when I go home to visit and drive by that area. No more potatoes to dig up from the hill, trouting to be done or berries to pick.